Most of us don’t think too fondly of the underground. It’s cold, dark, probably slimy, and full of the creepiest of crawlies. Most people, very sensibly, when confronted with cave or mine shaft, peek in the entrance, and continue on their way. Thankfully, the world is not only inhabited by sensible people. time at all. In this strange and fantastic environment, you have no choice but to be present in the moment. So, who actually experiences this? Cavers are the most obvious, a small community (The Northern BC Caving Club has around 20 members in a good year) driven by recreational and casual scientific interest in caves. Armed with ropes and mechanical ascenders/descenders, cavers map and explore places no human has been before. Adventure tourists may find themselves on one of the 4 guided cave tours offered in BC. Also, bat (and cave) researchers hypothetically go underground, although prior to the last few years there was little push for this kind of work. Most of the studies on BC bats in the 2000’s focused on bat habitation of abandoned buildings and other human conflicts. We know shockingly little about caves in BC (and North America in general). Possible entrances are marked as “karst” by natural resource surveys, and that’s about it. BC caving clubs are developing a classification system to help guide management practices, but no formal assessments have been done. We do know that there are bats in BC, and most of them overwinter in underground hibernacula… somewhere. This lack of understanding means what few management practices exist for bats and caves themselves are based on best guesses. The BatCaver program is attempting to rectify this by setting up sensors to detect bats in caves across western Canada, but it’s slow and difficult work. White Nose Syndrome (WNS) has killed over 7 million North American bats since it’s discovery in 2006. It is caused by Pseudogymnoascus destructans (Pd), formerly Geomyces destructans (Minnis and Lindner 2013), one of the rare cases where the scientific name sounds appropriately terrifying. It appears as a characteristic mycelial mat growing on the bat’s face (“white nose”) and wing membrane. Pd is not particularly well adapted to life as a pathogen. It lacks the enzymatic ability to thrive on blood or other rich tissue types (Reynolds and Barton 2014), instead growing mostly on surface skin. Mortality is an unfortunate side effect of the dehydration which across skin leisions. Basically, bats infected with Pd wake up more frequently during hibernation due to thirst, and use up their fat reserves long before spring (Warnecke et al 2012). Pd doesn’t thrive in sediment, but in the moist, cool, cave environment it can persist and spread (Reynolds and Barton 2014). This is a legacy of it’s genus, Pseudogymnoascus, which are very widespread saprotrophs of cave sediments across North America and Europe. Pd seems to be the only species that has made the evolutionary leap to pathogenicity (Lorch et al 2012). It has become increasingly clear that Pd was introduced from Europe. The method of introduction remains unknown, but most of the fingers point at cavers or bat researchers. However, given that Pd can persist in the general soil environment, it could have just as well been brought over anyone’s shoes flying from Europe to New York where it was first detected. 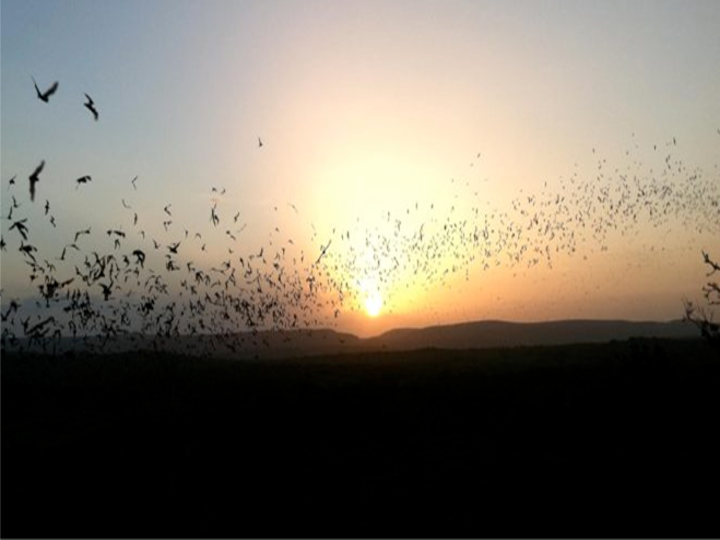 European bats are routinely infected with Pd, but it’s not particularly detrimental to them. Widespread Pd in Europe has been suggested as to a reason why there are so few bat species there. The North American strain of Pd seems to have become more virulent than the European one, which could be a result of the differing selective pressures given the total lack of host resistance found in North America. In the winter of 2015/2016, Pd was detected in Washington state. |There was a resulting scramble to develop new guidelines for cave entry BC and Alberta, as previous ones focused on not bringing gear over from eastern Canada. Both A NATIONAL PLAN to manage White Nose Syndrome in bats in Canada (Canadian Wildlife Health Cooperative 2015) and the 2016-2020 Action Plan (BC Bat 2015) attempt to prioritize and triage research and public outreach to minimize the impact of WNS. A few possible management tools have been developed, including standardized protocols for detecting Pd in the environment using real time PCR (Lorch et al 2013) and thereby tracking its spread. Also, there is a promising finding that the growth of Pd is highly temperature dependent, and that by cooling hibernacula (and therefore the bodies of the bats within), the infection rate could be decreased (Verant et al 2012). Coordination of management efforts are a major concern, as there currently is no consistency across space. Some caves are within park boundaries, and governed as such. Local caving clubs have no authority, but may coordinate some conservation efforts such as locking high sensitivity or easily accessible caves, with support from other stakeholders such as forestry companies. Stewardship responsibility falls onto visitors, with the hope that the remote nature of many caves keeps out visitors who may be poor stewards. There are two very different stories in terms of regulating the spread of WNS. On one hand, Pd and its spores can be killed with either hot water (>55oc for 20 minutes) or certain chemical disinfectants like alcohol, peroxide, and chlorine bleach. Current guidelines (Canadian Wildlife Health Cooperative 2016; updated from a joint plan in 2015) recommend decontaminating equipment after each use in areas known to have Pd, and to use separate, clean gear in areas not known to have Pd. On the other hand, bats move around a lot. Now that Pd has appeared west of the Rockies, which had presented a geographical barrier, it will be widely spread bat to bat. There currently are no management actions in place to limit this spread, and their development is slow due to our lack of even the most basic knowledge of bat winter ecology. The future is very uncertain for North America’s bats. Populations are being wiped out, and there are few proposed solutions to limit spread throughout the continent. Furthermore, the persistence of Pd in sediment means that species re-introduction programs may not be appropriate for at least a decade (Hoyt et al 2015, Reynolds et al 2015). However, as it stands right now, there is no reason that caves need to be avoided. 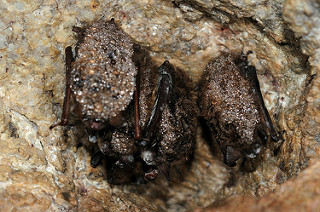 Actively disturbing bats certainly won’t help (as a general guideline hibernacula should not be entered in winter), but at this point, cavers, researchers, and other visitors are unlikely to make the problem worse. This work by Lori Johnson is licensed under a Creative Commons CC-BY Attribution 4.0 International License.